Projects on tap for this year’s Volunteer Day include putting up some signs on some trails, recently refurbished by the maintenance and park personnel. Several display cases that will house, for educational and informational purposes, both historical and environmental items and info have been built along some of Hibernia’s trails. Volunteers are badly needed, particularly with a short invite window. Volunteers are asked to be at the picnic shelter between Area 2 and Area 3 on the main park road at 9:00 AM, Saturday, May 21. For more information, contact the park office at (252) 438-7791. (Boydton, VA) Recent heavy rainfall has caused the Kerr Lake level to rise to +308 feet mean sea level. This rise has resulted in the closure of some park areas and ramps. The following is a list of the areas that are currently affected. Areas managed by the US Army Corps of Engineers that are closed so far are: Palmer Point Beach, Liberty Hill Fishing Access, Rudd’s Day Use, Bluestone Ramp, Staunton View Day Use, Buffalo Ramp, Grassy Creek Park, Ivy Hill Day Use, and North Bend Handicap Pier. Henderson Point Campground Ramp and Ramp at Shelter #2, and Henderson Point Wildlife Ramp. 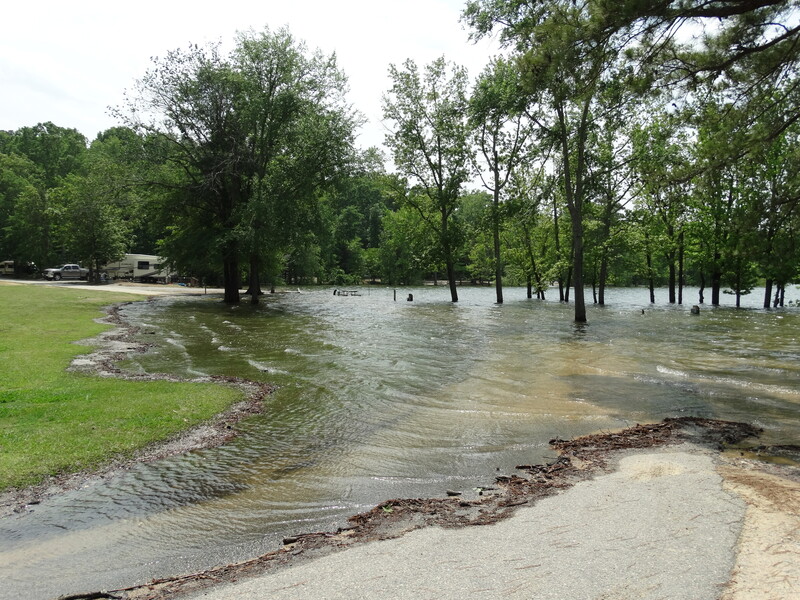 For campers, NC Parks advises that if you had reservations at Kerr Lake starting May 6th, please contact Reserve America at 1-877-722-6762/or on-line to find out if your reservation will be effected by the flooding. 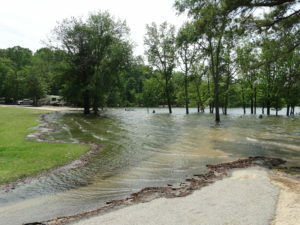 They may be able to accommodate current reservations by moving them to other campsites not effected by rising waters. This will affect on-line reservations until Tuesday May 17th, 2016. For camping with the Corps of Engineers, if you have reservations at Rudd’s Creek or Longwood, please call Recreation.gov at 1-877-444-6777 or go online to see if your site is available. For Buffalo Park, all water front sites are closed. For more information please call any park ranger at (434) 738-6143. In the weekly meeting this morning, the Corps meteorologist expressed concern about another weather system that he is watching that if it hangs up like the last one, could cause concern to Kerr Lake. As the waters push on upwards to 308 feet above mean sea level, many campers, particularly those at the NC State Recreation Areas on Kerr Lake have been forced from their sites, some told to leave, others fearful of the rising flood waters. Expected to crest sometime today, the high water has other anxious campers keeping a watchful eye. As a number of Kerr Lake Park Watch have been camping on the western shore of the lake, an album of some flood photos has been put together on Kerr Lake Park Watch’s Facebook page: Kerr Lake Park Watch May 2016 Flood Photo Album. Members of the media are welcomed to use the photos so long as proper credit is given to Kerr Lake Park Watch. As a couple of members of Kerr Lake Park Watch toured parks this afternoon, only a few of the hardy campers who have fairly high ground sites can be found on the North Carolina side. URGENT ALERT! The US Army Corps of Engineers this afternoon asked Kerr Lake Park Watch to assist in notifying the public with interest in the lake, that the lake is rapidly rising from an elevation of about 304.8 mean feet above sea level to 308.0 sometime Sunday. This rapid rise is due to high and somewhat unexpected rains yesterday and today ranging from 2 to 4 inches in the Roanoke River Basin all the way up to Smith Mountain Lake. IF YOU HAVE CAMPING PLANS AT A KERR LAKE PARK, particularly those in the seven State Recreation Areas on the North Carolina side of the lake, you should call the state park office at Kerr Lake or the state reservation center. Generally, the parks on the Virginia side are not as impacted as NC at 308.0 above mean sea level. Normal full pool of Kerr Lake is 300.0. On the NC side, rangers, maintenance people and practically all park staff have been moving some campers to available sites, sending others home and shutting down electrical camping boxes.